After a fatiguing journey by motor-car for a whole week, we arrived at Erzerum, where we were cordially and sincerely greeted by the whole of the population and the army on the 3 rd July. On the 5 th July I impressed upon all the commanding officers that they were to do everything that was necessary along the main thoroughfares to watch for and prevent any hostile movement emanating from the Government (Document 29). Munir Bey, the Vali, had been recalled to Constantinople. He was still at Erzerum, as I had asked him to remain there. Mashar Murfid Bey, who had given up his post as Vali of Bitlis and who was at Er zerum on his way to Constantinople, was also waiting there to see me. I thought it just as well to come to a clear understanding with these two Valis and with Kiasim Kara Bekir Pasha, commanding the XV th Army Corps, Rauf Bey who was accompanying me, the former Governor of Ismidt, Sureya Bey, Kiasim Bey, and the Chief of the Staff at my headquarters Husrey Bey, another of my Staff officers, and Dr. Refik Bey. I talked to them about the state of affairs in general and partic ularly about the present situation, as well as about the main lines it would be advisable for us to follow. On this occasion I went into the most adverse possibilities, the general and personal dangers and sacrifices to which we would all have to submit whatever happened. I pointed out that to-day only the Crown, the Government and the foreigners thought of annihilating all those who ventured to come forward for the protection of the national ideas. But in regard to this the possibility had to be considered that the entire country had been misled and prejudiced against the movement. The leaders had to decide, if they entered into the struggle, that they would never desert the cause whatever might happen; that they would hold fast and fight till their last breath to sacrifice themselves for their ideal and for the last inch of national territory. It would be fax better for those who felt that they were not imbued with this ambition to decline to embark on this enterprise, for if they did they would only be deceiving themselves and their country. Moreover, the task we had in view was one that could not be undertaken in secret under the protection of the authorities and the uniform. Up to a certain time this could have been done, but now that time had passed. Henceforth we had to go out into the public squares and places and raise our voices in the name of the rights of the nation and win the people, heart and soul, over to our cause. “There is no doubt about my having been called to this cause and having rendered myself liable to the most tragic consequences if my efforts should end in failure. To work with me in public, therefore, is to render yourselves henceforward liable to share a similar fate. Besides, from many points of view, it is not quite certain whether, after all, I am exactly the right man to face the situation, such as we have understood it to be.” However, in any case, it was necessary that a son of the country should be its leader. They might have somebody else in mind who was more fitted to lead them. All that would be expected of him, I told them, would be that he should agree to do whatever the actual circumstances demanded. As I thought it would not be judicious to come to a decision too hastily, I adjourned the meeting after having tendered this advice, so that my followers could have a little time in which to think it over and exchange their personal opinions. When we came together again my comrades expressed their wish that I would be the leader of the movement and cordially promised me their support. One of them, Munir Bey, begged that for important reasons he might be excused for the moment from taking part in the movement. I pointed out that, in spite of my formal resignation from the Army, the essential condition for success was obedience to my orders, exactly as though I were still Commander-in-Chief. Then our meeting came to an end. After beginning with Djevad Pasha and Fewsi Pasha, who in turn had been Chief of the General Staff in Constantinople, and with Ismet Bey, who was engaged in matters connected with the coming Peace Commission, I arrived at an understanding, as I had now done here and at Erzerum, with all the commandants and other officers and official and private persons with whom I had been in contact up to the time of my arrival at Erzerum. You will recognise the advantage of my having done so. The question that occupied me during the first few days of my stay at Erzerum was to make all the necessary arrangements for the congress to be held there. The branch of the League for the “Defence of the Rights of the Eastern Provinces/ which had been founded on the 3 rd March, 1919, at Erzerum for the purpose of forming an executive committee, had, in agreement with Erzerum, undertaken to convene a congress of the Eastern Provinces to be held on the ig 111 June. When I was still at Amasia this branch proposed to send delegates, and accordingly sent invitations to them. From that time until my arrival, and afterwards, the committee showed extraordinary activity in carrying this out. It can easily be understood how great were the difficulties en countered in realising such an aim under the conditions prevailing at the time. Although the io th July, the day fixed for the congress to meet, was already drawing near, the provincial delegates had not yet been chosen. It was now of the utmost importance to make sure that this meeting would take place. For my part, I had also done everything I could to help. While I was sending open communications simultaneously to each of the vilayets, instructions in cipher were sent to the Valis and the Commanders telling them what to do. After a delay of thirteen days we at length succeeded in getting together a sufficient number of delegates. It was very important indeed for the success of our national movement to get the Army to agree to the civil and military arrange ments. The Division at Trebizond was under the temporary command of an officer. Halid Bey, the Commander, was hiding himself at Bayburt. He had to be induced to leave his place of concealment for two reasons. The first, and the more important of the two, was to raise the moral of the people, and especially of the troops, by showing them that the order from Constantinople and the refussal to obey it need not cause them any anxiety or make it necessary for anybody to hide himself. The second reason was, that it was very important to have an energetic and fearless commander at the head of the division in case Trebizond, such a conspicuous place on the coast, should be attacked from outside. Consequently, I ordered Halid Bey to come to Erzerum. I gave him special instructions and ordered him to stay at Matshka, so that he could be ready to take up the command of his division immediately it became necessary for him to do so. While we were occupied with this, we had to lose time in giving some answer or other to the misleading telegrams from Ferid Pasha, the Minister of War in Constantinople, and the Sultan that were continually being sent to compel me to return to Constantinople. I replied: “I cannot return.” At last the curtain fell suddenly while the telegrams were still being exchanged with the Palace on the night of the 8 th July, and the comedy that had been going on for a month from the 8 th June to the 8 th July came abruptly to an end. Constantinople immediately cancelled my official commission. 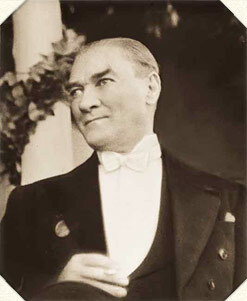 At the same moment 10.50 p.m. on the 8 th July I had sent a telegram to the Minister of War and another at n p.m. to the Sultan himself, in which I announced that I resigned my duties and my commission in the Army. I communicated this to the troops and the people. Henceforward I continued to do my duty according to the dictates of my conscience, free from any official rank and restriction, trusting solely to the devotion and magnanimity of the nation itself, from whom I drew strength, energy and inspiration as from an inexhaustible spring. You can easily imagine that many other persons, among them certain of those who were deeply interested in them, listened to my nightly communications with Constantinople. I hope you will permit me to lay before you a document that will give you some idea about those who, in these critical moments and subsequently, attempted to describe as tact and ability what I, to use a very mild expression, would prefer to call simplicity and weakness. Director of Communications in cipher to the 2* d Army Inspection. I had, indeed, heard four days previously, very much to my surprise, that Djemal Pasha, Inspector of the II nd Army at Konia, had left on ten days leave for Constantinople. Ever since I had landed at Samsoon I had kept up correspondence with him in connection with our co-operation in the national movement and the military dispositions we had to make. I had always received positive and encouraging replies from him. 1. I beg you to inform me clearly and without delay the actual reason for Djemal Pasha s departure for Constantinople on ten days leave. 2. You are on no account to give up the command of the troops in your district. It is absolutely necessary to take steps to guard against the most unfavourable possibilities, by putting yourself immediately into communication with Fuad Pasha. I beg you to send me short reports daily as to your position.